Quilt block patterns don't get much easier than the Mock Basket Weave design. Grab one or more striped fabrics, cut strips or squares, and use your quilt blocks to sew a quilt top or border in nothing flat. Stripes that run perpendicular to each other make a quilt or border look like true basket weave—without the fuss of extra piecing. 1 1/4 yards each of Stripe 1 and Stripe 2 for strip pieced quilt blocks. Strip piecing doesn't make the best use of yardage if you are sewing the blocks with one fabric. Cut squares and use chain piecing techniques to speed up assembly. To Sew Individual Squares: cut twenty-four 6 1/2 inch x 6-1/2 inch squares from two stripes, or 48 squares of the same size from one stripe. You can make this quilt block any size you wish. As long as all the squares are the same size, you'll be set. Use a 1/4 inch seam allowance to sew the Mock Basket Weave quilt block, placing patches right sides together for sewing and matching edges. Secure fabric with straight pins to keep them from moving. If your components are consistently too small, sew with a scant quarter-inch seam. To make stripes run in opposite directions, sew your long fabric strips lengthwise in pairs to make strip sets. Each pair should have a stripe that runs along the length of the strip and one that runs across the length of the strip. Press the seam allowance either way, but be consistent with each strip set. Square up one end of each strip set and cut a total of (24) 6 1/2 inch segments. Gather two segments and flip one around so that unlike stripes are adjacent to each other. Match the center seam and edges carefully, then sew together to complete a quilt block. Repeat to make eleven more Mock Basket Weave quilt blocks. To make a larger quilt, sew additional strips together, trim, cut segments and assemble more blocks. 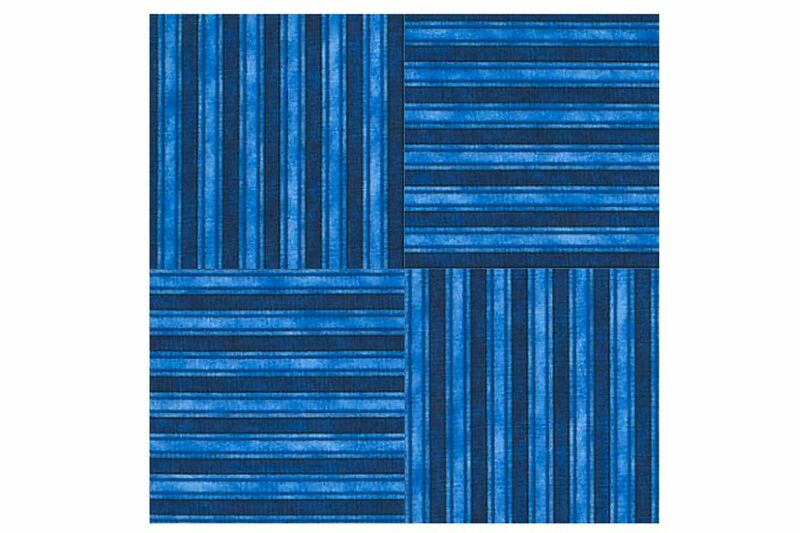 Sew two squares together side by side, stripes running in opposite directions. Press seams either direction, but be consistent from unit to unit. Sew units together in pairs to make quilt blocks. The quilt block should measure 12 1/2 inch square. If you count the squares across in this quilt layout, you'll find that there are eleven rows of squares, instead of the ten you'd expect for a four-patch quilt block. Take a look at that last row on the right. It's half of a block and was added for symmetry, to make the first vertical row of squares match the last vertical row. It isn't necessary to arrange your blocks like that—it's just an option to consider.